It’s true. There are enough licensed child care spaces in Canada for just 28% of children ages 0-5. But the demand for child care for children in that age range is more than double that. Getting on waiting lists, even when there are fees applied to get on those lists. Putting their kids in unlicensed spaces. Relying on family for child care. And of course, paying more out-of-pocket once a space does open up. Canada needs a progressive and fully funded plan to make affordable, accessible and safe child care a reality for Canadian parents. Join the call for action by sharing this image and website. 1. Remplacer le plan de dépense actuel en matière de garde à l’enfance par un plan qui permettra au gouvernement fédéral et aux provinces et territoires de bâtir au Canada un système universel de services de garde abordables, de bonne qualité et inclusifs pour tous les enfants et leurs familles au cours des dix prochaines années. 2. 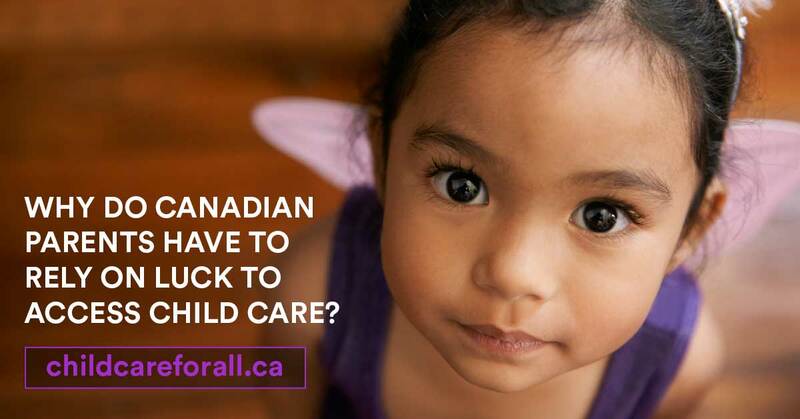 Allocate $1 billion for child care in the 2018-2019 fiscal year and increase that amount each year until public spending on child care reaches at least 1 per cent of GDP, the international benchmark used by the OECD, UNICEF and other international bodies. • Women’s equality: quality, affordable and inclusive child care is the ramp to women’s equality and key to productivity and economic growth.